Home > Transportation > The Bike Campaign: For Maria the Only Way to Go Is by Bike! The Bike Campaign: For Maria the Only Way to Go Is by Bike! Cool Davis welcomes The Bike Campaign and Bike Garage as our newest Partner! Founder and director Maria Contreras Tebbutt wants to reduce car trips and increase bike safety. It’s that simple. She encourages everyone who possibly can to take up bike riding. As part of The Bike Campaign program, Maria first makes sure that a bike is road worthy and “street legal,” that is, it meets state code for bikes. She also wants to be sure the bike is correctly fitted for the rider. And last but not least, she wants the rider to know the rules of the road and how to ride safely. The Bike Campaign also helps individuals who cannot afford to buy a bike to get one at low cost or almost free. The Bike Campaign depends on donations of bikes to support this work. Donated bikes are repaired and stored at the Bike Garage, located in Woodland, where The Bike Campaign first began its work. After several successes in Woodland, Maria began to look more closely at Davis, and realized that while the City of Davis, Bike Davis, and the Bike Collective (aka Bike 4th) were doing great work, there was a still a need for The Bike Campaign’s emphasis on getting people out of cars and bike education. 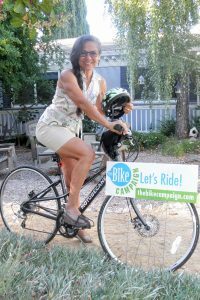 Bike Campaign Founder and Director Maria Contreras Tebbutt practices what she teaches. Bike Campaign volunteers reach out to students and others who may be biking for the first time or who haven’t biked in years. For example, this fall in Davis, the organization provided free clinics at seven different apartment complexes that house UCD students. Volunteer mechanics checked over student bikes using a 50-point safety inspection list and reviewed state laws and safety concerns with those who attended. For folks in need of transportation, the organization takes calls from Social Services and other service groups. Once a needs assessment is completed, a Bike Campaign volunteer provides a bike free to the person and basic education about bike care, safety, and laws before the person rides off – often with genuine gratitude and appreciation. 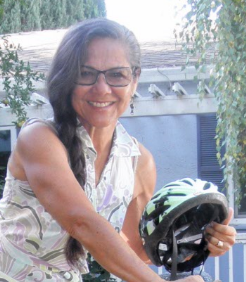 Another special feature of The Bike Campaign is that Maria is able to speak Spanish for those in our community who want to ride a bike but might hit a language barrier. Se habla espanol! The Bike Campaign may be contacted via their website. Let them know you found out about them through Cool Davis! Local businesses, organizations, and other groups are welcome to apply to become a Cool Davis Partner. 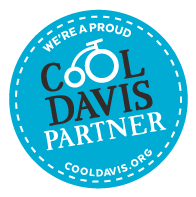 Learn more about How to Become a Cool Davis Partner. Click here for a full list of Cool Davis Partners.